AOPA Home / 2019 / March / Read the March O&P Almanac now. 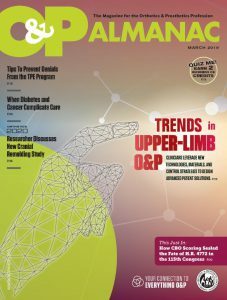 Find out which six trends are making the biggest impact on O&P upper-limb patient care; read tips for treating patients experiencing complications from diabetes, cancer, and cardiac disease; learn why H.R. 4772 was pulled before it came to a vote during the 115th Congress; meet a researcher who’s leading a cranial remolding orthosis study as part of Orthotics 2020; earn 2 CE credits by reading and taking the quiz on this month’s Reimbursement Page article; see the latest data on the rising number of uninsured in the United States; and much more.